Safe, reliable electrical service to power an advanced biology education and research laboratory; $75,000 in annual energy savings; reduced carbon footprint; high levels of occupant safety and comfort; LEED (Leadership in Energy and Environmental Design) Silver certification. To maintain Pomona's leadership in science education by building a new, state-of-the-art, environmentally responsible biology laboratory. Dynalectric successfully completed this innovative project by putting its extensive "green building" expertise to work. While coordinating its efforts with those of other contractors, the Dynalectric team brought new duct banks from the college's 12-kV (kilovolt) backbone system to an upgraded central plant. The team then routed the power to a network of lighting and electrical panels throughout the 46,000-square-foot structure and, ultimately, to individual fixtures and receptacles. To help the client achieve its LEED Silver certification, the company installed a system of ambient daylight sensors and dimmable fluorescent fixtures. Instead of using the building's artificial lighting as the primary light source, these devices save energy by regulating it to supplement light coming in through the windows. To further increase lighting efficiency, Dynalectric installed occupancy sensors that turn off lights when the lab's public areas are unoccupied. Out on the roof, company technicians wired photovoltaic panels to an inverter that feeds solar power into the building's AC (alternating current) system, while on the ground, other company professionals connected charging stations that power electric vehicles used on Pomona's campus. In the building's laboratories, company crews installed the fans and control circuitry for toxic gas containment hoods and brought power to lab bench lighting and communications connections. In addition, Dynalectric put in the lighting for the building's greenhouses as well as the circuitry needed to regulate interior temperatures by controlling roof vents. Finally, the company installed exterior lighting to illuminate the three-story building and its landscaping. Pomona's new biology building contains two classrooms, four green houses, two lounges, faculty offices, sterilizer and glass washing rooms, incubator rooms, darkrooms, walk-in cold (or warm) rooms, and sterile glass transfer rooms. 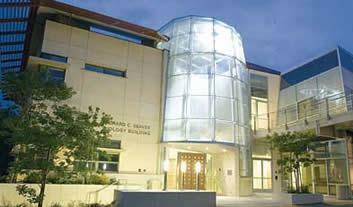 It exceeds California energy-related design codes by 10 percent. The lab is Pomona's first facility designed to LEED guidelines. Its energy-conscious design places it in the top one percent of all academic laboratory buildings in the U.S. Established in 1887, Pomona College is widely regarded as one of the premier liberal arts colleges in America. Located 35 miles west of Los Angeles in Claremont, California, it is the founding member of The Claremont Colleges, a consortium of seven independent institutions blending the intimate atmosphere of a small college with the academic and social resources of a university.